Bioinformatics embodies a set of critical skills necessary to derive insights from biological datasets in a cost effective and lab free manner. Such skills are not readily accessible in the African context. 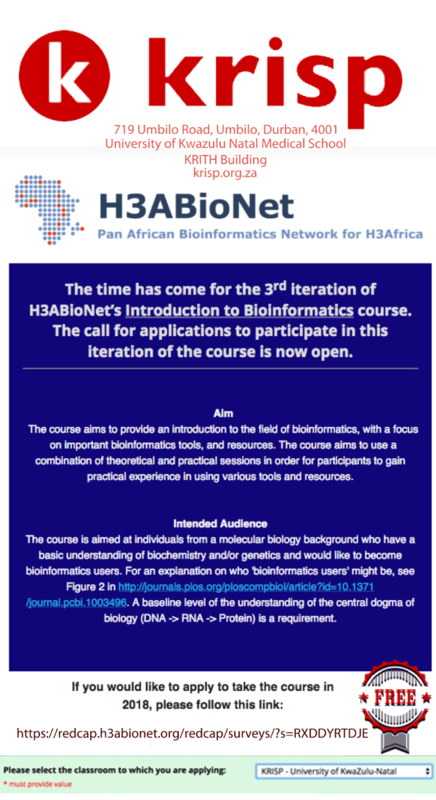 To address this challenge, KRISP as part of the H3Africa initiative is hosting a class for the introduction to bioinformatics course (IBT). The course is intended to provide foundation skills and a general introduction to the field of bioinformatics with a focus on important tools and resources. To ensure accessibility of the course to learners, a combination of theoretical and practical teaching methods are used. The course, happens twice a week (Tuesday and Thursdays 1pm to 3pm), it will run up to 14th of December 2018. Learners, have an online session with leaders in the field twice a week were they get to ask and get answers to key questions about the content and field in general. Through this course, KRISP is enabling up to 30 learners explore the bioinformatics and gain skills necessary to embark on a journey to pursue a bioinformatics career.